Heads up, a six-ton satellite the size of a double-wide is headed our way. But stay calm, NASA has done some calculations and concluded that the odds of a human getting hit by debris are 1 in 3,200 — not astronomical, but fairly unlikely. The odds of it being you, personally, are much, much lower, since there are currently 7 billion humans running around the place. Still. Long shots do happen, ask a bookie or any Las Vegas oddsmaker. Not everyday, maybe, but with unsettling frequency. Watch the news. In the case of this satellite, the UARS (Upper Atmosphere Research Satellite), NASA intentionally altered its orbit to bring it down earlier than planned, its job was redundant. But now that this apparatus is on the way, they’re not exactly sure where it will crash or when. Maybe Thursday, maybe Friday, could be Saturday. And anywhere from 57º north latitude to 57º south latitude. In this part of the world that ranges from Newfoundland to South America, give or take a few thousand miles. But that could all change. 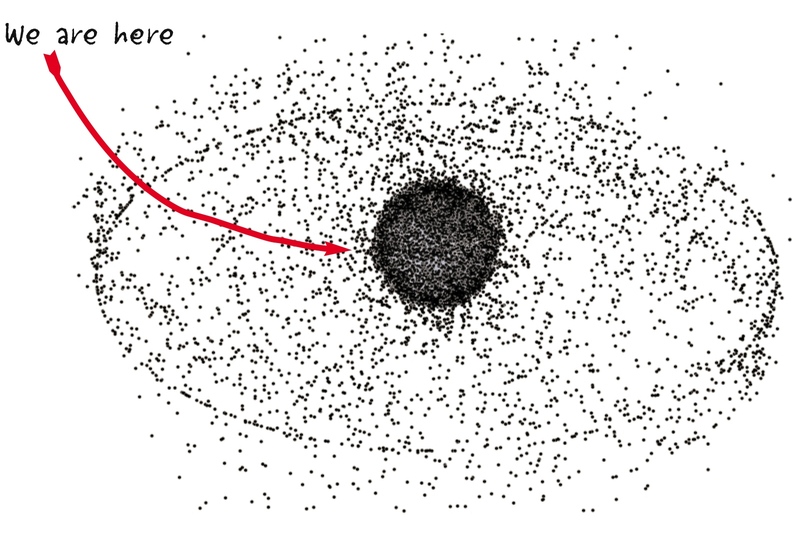 Keep in mind, there are thousands of pieces of space junk floating right above us, each one a Sword of Damocles. The odds are someone, somewhere is going to be tapped sometime. We just won’t know when or where. Neither will NASA and they’re the ones who send most of this crap up there in the first place. One NASA dude, bearing the title of Chief Scientist for Orbital Debris, issued a reassuring “no one’s ever been hurt.” And I thought ‘yet,’ luck doesn’t hold forever. The way I see it we have two choices: panic and head for Antarctica or grab a beer and watch the light show. As UARS breaks apart, the pieces should create some lively fireballs we’ll be able to see even in daylight. Ooooooh, aaaaaaaah, OWWW! Note to self: pick up a sturdy umbrella. “Oooooh… aaaaaah …. OW!” HIlarious! Oh, and since I still can’t leave a comment on your blog, thanks for the mention. With posts like ‘toilet seat’, the limelight will find you soon enough. I remember my grandmother was paranoid that a piece of the original space station was going to fall on her house. There were hats everyone was wearing with targets on the top. Most, if not all of it, will burn up in the atmosphere on re-entry I suppose, still I would get my 15 seconds of fame if a piece landed in my living room. Oh, c’mon, you’d get a full :30. Actually, it’s a serious issue – this space junk thing. Apparently, there’s a lot of garbage up there that isn’t being removed. But, of course, that’s just like human nature: leave the mess for someone else to clean up. Space is filling up with tons of hardware, you’re right. In fact, the military is tracking more than 20,000 pieces of space junk according to what I’ve read. Would a vacuum even work in space? I think they could use laser technology to break the pieces into dust. I wouldn’t recommend a vacuum. That’s one huge bag to empty.